We hope everyone enjoys the Super Bowl today. If you are heading out to take in the game with friends, make arrangements ahead of time on how to get home safely. Don’t drive impaired. New laws in Ontario allow police added powers to combat drinking and driving. 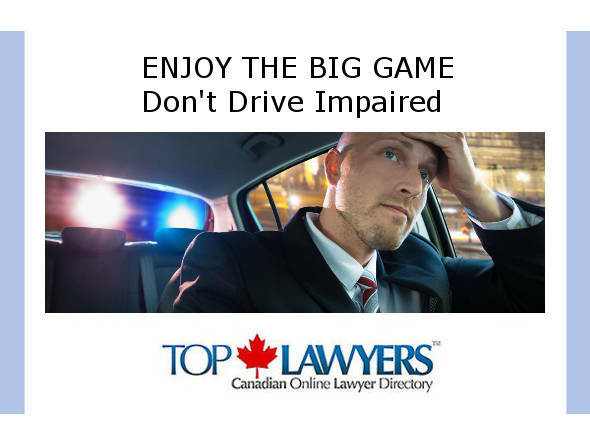 If you are arrested and charged with any criminal driving offence, including DUI, Driving Over 80mgs or Refuse Breath Sample – You have a right to legal counsel without delay. We can help you! Whether you are a sole practitioner or a law firm with offices across Canada, our national online lawyer directory, toplawyerscanada.ca; and our related municipal based lawyer directories, give you the exposure you need in a competitive legal marketplace. Contact us today for details or click here and join up right now!